Pack in tons of history into two days on this St. Petersburg city tour, including transport. Visit main attractions, such as Church of Savior on Spilled Blood, Peterhof Palace and Garden (Petrodvorets), and Kazan Cathedral. 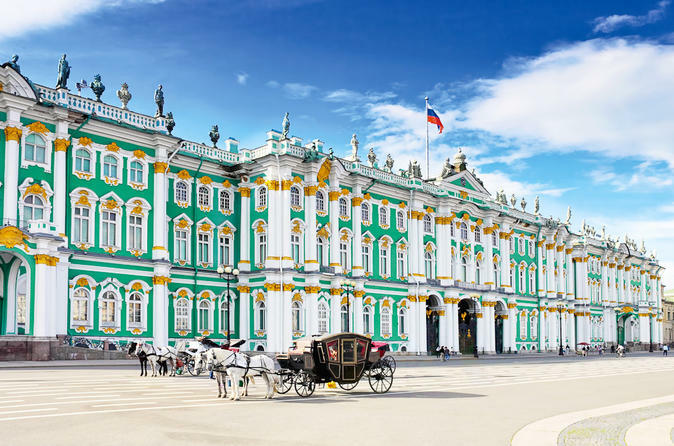 Go on a walking tour of the city as well as a boat cruise, and enjoy early access at The Hermitage. Visa-waivers (tour tickets). This is a VISA-FREE tour for cruise ship guests! Gratuity. Recommended gratuity is 10% for the guide and 5% for the driver, given separately. The actual start and end times of the tour are shown in the tour ticket. Visa-free tours available for cruise ship passengers. In order to qualify for the visa-waiver (tour ticket), please provide the following at time of booking for all participants: your name as shown on passport, passport number, country of citizenship, and your date of birth. Additionally, please inform us of your ship name. On both days of your tour, the following 2 items are required: a current valid passport and your visa-waiver (tour ticket). You will need both of these documents to clear Russian immigration. This tour is not wheelchair-accessible. Collapsible wheelchairs can be accommodated provided that the guest is accompanied by someone who can assist them. Children under the age of 4 years are not permitted on our group tours. If you are touring with small children, we recommend that you book a private tour to allow your youngsters the flexibility to comfortably move at a slower pace. Students over the age of 18 require an International Student Identity Card (ISIC) in order to claim their student discount. The ISIC must be presented to the guide on each morning of your tour. Please advise of any specific dietary requirements at the time of booking. Lunch will not be provided to customers touring free of charge unless requested.